Rob joined the Mote team in Spring 2017. His research interests are broad and include understanding how predators influence their surroundings, how biological interactions can degrade or bolster the resilience of ecosystems, and how such interactions are influenced by climate change. He is also interested in using chemical techniques (i.e., Stable Isotope Analysis) to improve our understanding of how ecosystem disturbances influence animal feeding. Rob's dissertation research tracked the impacts of a marine heat wave that caused massive damage to Shark Bay, Western Australia- one of the world's largest seagrass ecosystems. Here, he studied the impacts of the seagrass loss on a variety of animals that rely on it, including sea turtles, fish, sea snakes, dolphins, dugongs, sea birds, and large sharks. Rob also gathered data to determine whether Shark Bay's seagrass can recover, and most importantly, whether Shark Bay's apex predator, tiger sharks, can help in that recovery. This work involved eighteen months in the field, sampling of thousands of animals through a variety of methods, and hundreds of hours underwater. At Mote, Rob is interested in applying what he learned about resilience in seagrass ecosystems to coral reefs. 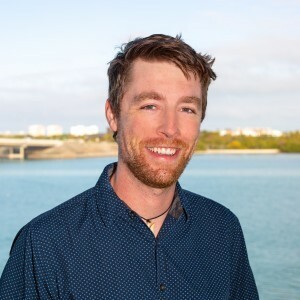 His goal is to enhance reef recovery efforts by identifying how we can rebuild other aspects of the ecosystem (like fish communities) that can make reefs resilient to an increasingly stressful world. Another goal of Rob's is to establish long term shark monitoring in the lower Florida keys to provide baseline data for restoration and management. Ferreira, L., Thums, M., Heithaus, M., Barnett, A., Abrantes,, K., Holmes, B., Zamora, L., Frisch, A., Pepperel, J., Burkholder, D., Vaudo, J., Nowicki, R., Meeuwig, J., and Meekan, M. 2017. “The trophic role of a large marine predator, the tiger shark Galeocerdo cuvier". Scientific Reports. Nowicki, R., Burkholder, D., Thomson, J., Fourqurean, J., Heithaus, M. 2017. “Predicting seagrass recovery trajectories and their implications following an extreme climate event”. Marine Ecology Progress Series. Nowicki, R., Heithaus, M., Fourqurean, J. 2017. “The role of consumers in structuring seagrass ecosystems: direct and indirect mechanisms”. Biology of Seagrasses, Second edition. Springer. Stroud, J.T., Bush, M., Ladd, M., Lemoine, N., Nowicki, R., Shantz, A., Sweatman, A. 2015. “Is a community still a community? Reviewing definitions of key terms in community ecology”. Ecology and Evolution.